You may choose to support the Cure Brain Cancer Foundation, the Humpty Dumpty Foundation and SIDS and Kids through our onsite collection box, by donating online or by purchasing Merchandise. If you would like to Donate Online please Direct Debit Cambage Court Christmas Lights and 100% of funds raised will be equally donated to each charity. We will also have a merchandise stand where the proceeds of the items sold will be also evenly divided between our three display charities. 100% of the funds raised will be donated with each charity receiving a equal share. For example if we raise $12,000 dollars $4,000 dollars will be donated to each charity. Founded by Executive Chairman and Founder Paul Francis (OAM), Humpty has been providing support for children's services since 1996. 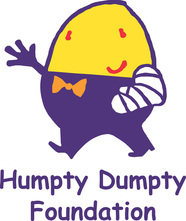 Humpty buys essential and often life-saving medical equipment for Neonatal Units (Newborn Care) and Paediatric Wards (toddlers and children to 16 years) in hospitals and health service centres across Australia. Humpty also provides funding for special projects including the magical Fairy Gardens (which encourages healing), paediatric fellowships (for graduate doctor training), weekly visits by the 'Clown Doctors' and the establishment of The Humpty Dumpty Paediatric Gait Analysis Laboratory at The Children's Hospital at Westmead. Over the years, Humpty's corporate and community support has grown and we now provide equipment to over 200 hospitals around Australia. We would all like to believe that our hospitals have all the necessary equipment they need to look after our children in an emergency, but put simply, they don't. Humpty's vision is to ensure that hospitals and health service centres across Australia have the right medical equipment they need to save the lives of sick and injured children. By purchasing medical equipment off Humpty's Wish List donors are helping to give medical teams the best possible chance of averting a tragedy. SIDS and Kids provides bereavement support for individuals and families who experience the death of their baby during pregnancy, birth, infancy and childhood. This includes miscarriage, stillbirth, neonatal death, sudden infant death (SIDS) and the death of a child up to 6 years of age. Through our key services of education, training, bereavement support and advocacy, we help support many individuals and families in their time of need. SIDS and Kids focus is also on education through programs such as the Safe Sleeping Campaign which has significantly reduced the incidence of SIDS over the last ten years. Our mission is a bold one: To increase five-year survival to 50% within 10 years. There are many different types, grades and forms of brain tumours and brain cancer. Find a summary of these areas below together with useful additional references for more information. A brain tumour (or “tumor” with the American spelling) is a mass of unnecessary and abnormal cells growing in the brain. There are two basic kinds of brain tumours – primary brain tumours andmetastatic brain tumours. Brain tumours are named according to where the tumour originated, its pattern of growth and whether it is benign or cancerous. The tumour is also graded by its degree of malignancy and its chances of growing and spreading. There are approximately 130 different types of brain tumour. Names of the more common varieties include: gliomas (astrocytomas, glioblastomas, oligodendrogliomas, ependymomas and mixed cell type gliomas) meningiomas, medulloblastomas and central nervous system lymphomas. Brain tumours can be benign or malignant. Malignant brain tumours are also called brain cancer. A tumour that starts in the brain is a primary brain tumour. Primary brain tumours may be grouped into "benign" and "malignant" tumours. Glioblastoma multiforme (GBM), astrocytoma, medulloblastoma and ependymoma are examples of primary brain tumours. A benign tumour consists of very slow growing cells, usually has distinct borders, and rarely spreads. Treatment and/or surgery is often effective, however, if a benign tumour is located in a vital area of the brain, it can be considered life-threatening. Malignant brain tumours vary widely both in the way they grow and the way they respond to treatment. Some are neatly contained within a capsule (encapsulated) and relatively easy to remove. Others have long, thin filaments spreading through the brain, like the roots of a plant. Metastatic brain tumours begin as cancer elsewhere in the body and spread to the brain. All metastatic brain tumours are malignant since they begin as cancer elsewhere in the body. Most common metastatic brain tumours start in the lung, breast, colon (bowel), or skin (melanoma). For more information about metastatic cancer visit Cancer Council Australia, orCancer Australia. Children are different to adults—their bodies and brains are still developing. Their tumours are different too. The most common childhood brain tumours are not the same as the most common adult brain tumours. Though rare, brain tumours are the most common form of solid tumours among children under the age of 15. Childhood tumours frequently appear in different locations and behave differently than brain tumours in adults. Treatment options vary depending on the type of tumour and age of the child. Children with tumours may also have a much better prognosis than adults with a similar condition. To read more about childhood brain tumours, click here. Most doctors now use the World Health Organization (WHO) classification system to grade brain tumours. Another method of tumour classisficiation is ‘staging’. To learn more about cancer staging click here. Astrocytomas grow from glial cells. Glia provide structure in the brain and spinal cord, and probably have other functions such as nourishing nerve cells and playing a role in learning and memory. Astrocytomas can occur in any part of the brain or spinal cord. They can either grow slowly, or grow rapidly and invade surrounding brain tissue. CNS lymphoma is a disease in which malignant cells form in the lymph tissue of the brain and/or spinal cord. The lymph system is part of the immune system and is made up of the lymph, lymph nodes and vessels, spleen, thymus, tonsils and bone marrow. Lymphocytes (carried in the lymph) travel in and out of the CNS and in some cases become malignant. An aggressive but rare tumour that it arises in the glial tissue of the lowest, stem-like part of the brain which controls many of the body’s most vital functions. DIPG primarily affects children. Read more about childhood brain tumours here. Ependymomas may originate from ependymal cells (which line the ventricles of the brain and the center of the spinal cord) or from radial glial cells (cells related to early development of the brain). These are relatively rare tumours. Subependymomas are a Grade I type of ependymoma and usually occur near a ventricle. Also called “astrocytoma, grade IV” and “glioblastoma multiforme” or “GBM”; glioblastomas commonly contain a mix of cell types. Glioblastoma cells are highly malignant; there are abnormal and numerous blood vessels and a high per centage of tumour cells are reproducing (dividing) at any given time. Necrotic (dead) cells may also be seen, especially toward the center of the tumour. Glioblastomas are generally found in the cerebral hemispheres of the brain but can be found anywhere in the brain or spinal cord. The group of brain tumours that includes astrocytomas and oligodendrogliomas. Gliomas are the most common types of malignant brain tumours. Together, they make up about 40% of all primary brain tumours and around 70% of all primary malignant brain tumours (brain cancers). Medulloblastomas are always located in the cerebellum—the part of the brain that controls movement. Medulloblastomas are fast-growing, high-grade tumours which frequently spread to other parts of the central nervous system. Given its location—close to one of the fluid cavities of the brain called the fourth ventricle—the tumour may also extend into that cavity and block the cerebrospinal fluid circulation or send cells through the spinal fluid to the spine. These tumours arise from the arachnoid mater—one of the layers of the meninges (the lining of the brain). Anaplastic or malignant meningiomas (grade III) and papillary meningiomas are malignant and tend to invade adjacent brain tissue. A mixed glioma containing a high proportion of both astrocytes and oligodendrocytes. A type of tumour that is thought to grow from oligodendrocytes, which are cells that normally provide insulation to nerves in the brain. More details about adult gliomas can be read or here. It is not known what causes brain cancer— it appears to occur randomly. This is why we need to invest in research. For the vast majority of people with a brain tumour, no outside cause can be clearly identified. Most astrocytomas and oligodendrogliomas occur when there is damage (a mutation) in genes that control how a cell grows and multiplies. The cells with the gene mutation develop into the tumour, but the abnormality cannot be inherited by the person’s children. Brain tumours are rare, so it is extremely difficult to collect information about a large enough group of cases to enable statisticians to make reliable conclusions. However, information is being collected around the world and here in Australia, and researchers plan to analyse data from a large number of patients with gliomas. Cure Brain Cancer is promoting collaboration within Australia and internationally to not only share discoveries and extend clinical trials but also to maximise the data available. Research is underway into whether certain genes are important risk factors for brain tumours. Read more about brain cancer research supported by Cure Brain Cancer. Symptoms may be associated with the type, size, and/or location of the tumour. Symptoms may be caused by treatments used to manage it. Surgery, radiation, chemotherapy, and other treatments all have the potential to generate new symptoms as they work to reduce the impact of the tumour. More information about brain tumour symptoms and diagnosis can be found herefrom the Brain Foundation in Australia or here from ABC2 , one of our international partners. It is difficult to predict accurately the outcome for a person with a brain tumour. Because each person’s circumstances are different, they may not give an accurate idea of survival time that can be expected for an individual. Read more about support and care for people living with brain tumours here. Read more about the facts and statistics regarding brain cancer here.